Windows 2000 insists on setting my server's IP address to 168.92.0.whatever as soon as I enable Internet Connection Sharing. This, of course, stomps all over my sane and logical IP address system as well as immediately breaks my network connection to every other computer on the network, all of which (okay, all one of which at this point) get their IPs through DHCP. If I set my server's IP address back to what it's supposed to be, my Internet Connection Sharing doesn't work anymore. How do I make it not do this? I want my IP address to be something I have a passing chance of remembering (my current scheme is 128.128.128.X), and I want my Internet Connection Sharing to work. Why does Windows insist on doing this? How to I make it stop? Can I? Actually, I think you'll find it's 192.168.0.1, or possibly 169.254.0.something. Microsoft doesn't want you to change that, but you can, by editing the registry, as described here. Alternatively, you can just use some other NAT package - software, or a dedicated sharer/firewall box, which would give your LAN Internet access without any particular PC needing to be on. It should also be noted that 128.anything is not a good addressing scheme to use for a LAN that's connected to the Internet, as that's a bunch of addresses that Internet servers can and do use. 128.128.128.128, for instance, is alvin.whoi.edu; if you've got a local machine using the same IP address as an Internet machine that you want to access, you'll have Problems. Stick to the specially designated private IP ranges (10.x.y.z, 172.16.x.y, 192.168.x.y) and you won't face these difficulties. 16 times 12 equals 210?! I have a quick question about megapixels as it applies to still digital cameras. Before going on holidays last year I bought a Canon IXUS 300. On the camera is stamped "2.1 megapixels", yet the largest photo it can snap is 1600x1200. Isn't this 1.92 megapixels? On the whole I am happy with this little camera as it suits my needs but I am curious as to how Canon arrived at 2.1 megapixels on its marketing material. The sensor may have 2.1 million pixels, but they're not all used for imaging. This scam is a common one among digital camera manufacturers. This page explains exactly how you've been ripped off. The DR202 Lithium Ion battery in my KDS Valiant Laptop has lost most of its lifespan. Currently it lasts between 30 and 40 minutes depending on what I am doing. Is there any way to resurrect this battery from it's mid-life crisis? For a short term quick fix I have been using a 12Ah 12VDC sealed lead acid battery (Panasonic LC-RA1212P1) and a 1.6 amp 175 watt (Vector, MAXXsst vec060) power inverter (converting to 110AC). Yeah, it's heavy. I wonder, how much power I am wasting in the conversion process from DC to AC and back to DC? Is there a mathematical way to calculate how long this big battery should last? The battery's probably not having a mid-life crisis; it's probably having an end-of-life one. Batteries wear out, and I'd say that yours has. Lithium ion batteries should be good for hundreds of full cycles, but daily plugged and unplugged use of a laptop, even if you don't completely discharge the battery and thus use up less than one full cycle per day, can use those cycles up quite quickly. The cure is a new (rather expensive) battery. If your inverter and your laptop's power brick both have, say, 90% efficiency, then you're getting 81% efficiency overall from your heavy alternative battery rig, which is pretty good. Older inverters often have lousy efficiency; current models are often better than 90%. Switchmode power bricks also typically have better than 90% efficiency. I doubt you'd be getting better than 90% overall, though. You can't calculate the run time for a given battery system without knowing exactly how much the laptop's actually drawing. You can find that out empirically by hooking up an ammeter in series with one of the 12 volt cables between the battery and the inverter. I've noted that reviewers state that to achieve synchronization between a 533MHz P4 and its memory, in a dual-memory controller environment, you would want PC2100, or 266MHz RAM. 266 x 2 memory controllers = 533MHz, and your CPU and memory are now synced, hooray for performance. However, when talking about synchronizing an Athlon, nobody pays any attention to how many memory controllers there are. This seems odd, since if you've got two memory controllers, such as in the nForce 1 and 2 chipsets, then wouldn't you want the sum of the memory busses to equal the CPU bus? So, if you had a 400MHz FSB Athlon, you'd want PC1600, 200MHz x 2? The nForce and the nForce2 only give you a noticeable benefit from their DualDDR/TwinBank mode when you're using their integrated video. If you're not using integrated video - which you certainly won't be, if you've bought one of the basic-model boards that don't even have it - then the dual channel mode does roughly nothing. Oh, OK, it does give you a five to ten per cent benefit in real world applications that are actually hitting the RAM reasonably hard, thanks to latency reduction, but it's nothing like what you might expect from the numbers on the back of the box. The reason for this is that the north bridge chip on these boards only has one RAM channel worth of memory access bandwidth. It bottlenecks the CPU's RAM communication speed. The nForce/nForce2 graphics core has a separate path to memory, and so it can benefit substantially from dual channel mode, but nothing else can. Nvidia's blather about it doubling your this and reducing your that, in the general sense, is just marketing nonsense. 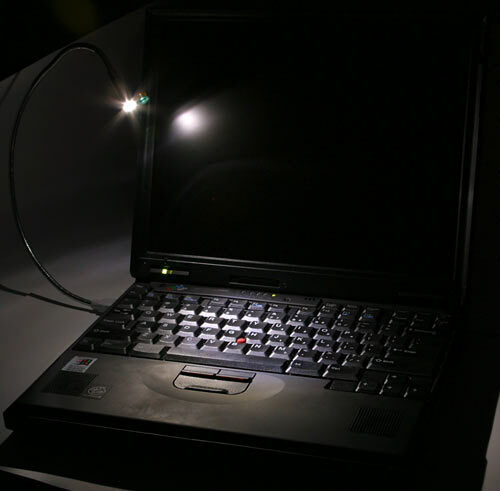 How did you take those night pictures of your laptop in the dark with the USB light [in this review]? I can't take any pictures without total light with my HP C500. I'm totally camera ignorant, so any help would be appreciated. I used a long exposure, and a proper digital camera. You know - the kind that costs a lot of money and is rather heavy and has a bit of a learning curve. You don't have to have a fancy camera to do this sort of thing, though. My picture was a 10 second exposure at f11, ISO 200, but you could get just as bright a shot with less depth of field (so the front and back corners of the subject would be blurry), by using your camera wide open at f2.8, with a shutter speed of 1 to 2 seconds (your camera only has an ISO sensitivity of 80). Most digitals start getting very noisy very quickly when you ask for an exposure of a few seconds (my D60 doesn't), but a one to two second exposure shouldn't be too awful. Apparently (according to this review, anyway), if you turn off the C500's "Handheld" option (and use it with a tripod or other support) you can get shutter speeds up to two seconds out of the thing. So it ought to be possible to do such an exposure. The C500 has no manual focus and, apparently, no proper manual exposure controls either, though, which could be a problem. If you have to light the subject to focus on it and the auto-exposure is set at the same time, then you'll get a black frame if you turn off the light before taking the picture. I own an Archos Jukebox MP3 player, which is a fairly basic hard drive with firmware to play songs (legally obtained songs, I hasten to add). The performance has been very good, except for one area - battery life and charging. I've owned this little bugger for about three years now, and the little cells are wheezing their last. I contacted the company about replacements, but they want an enormous sum of cash for four little cells. Perhaps you have a better suggestion for replacement, as you seem pretty erudite with respect to these little shocks in a can. The information on the batts is as follows: AA 1500mAh, 1.2 volts. Is it possible to just replace these with an alkaline or lithium cell that has the same rating, assuming it will fit? The Jukebox is powered by ordinary nickel metal hydride (NiMH) AA rechargeables, which you can buy from any half-decent electronics store. Any capacity of NiMH from 1500mAh on upwards (you can get 2000mAh AAs now, but they're not very good value) should fit and work fine. You may or may not get more run time from higher capacity cells, as the charger might not fully charge them. Many chargers will work fine with somewhat higher capacity cells, though; they just take a bit longer to finish the charge. I've seen ATX extension cables for larger server cases but I cannot seem to find one for those square 4 pin ATX12V receptacles. Do they exist? Would it be possible to make my own? I haven't seen one pre-made, though there's no reason why one couldn't exist. You wouldn't want a whole lot more cable between the PSU and the motherboard, but another couple of feet wouldn't be an issue. Finding an in-line socket to make one yourself could be annoying (see this piece for more on the fun that sort of thing can be), but there's no reason why someone slightly handy with a soldering iron couldn't just graft some more wire into the middle of the four ATX12V wires. It'd only be about a ten minute job. I was wondering what's the use of the metal sheet on stock P4 coolers. So, I peeled one off mine to see that there's another layer of wax underneath it. Is it OK for me to do so? Do you think I could actually improve the thermal conductivity by cleaning the wax off and lapping the bare base a bit? The sandwiched foil thing you took apart is a standard kind of thermal pad. Waxy thermal goop on each side, foil in the middle, usually with adhesive on two or four un-gooped edges of the foil. The resulting object is easy to apply to a heat sink, and provides decent thermal transfer performance. I checked out some similar items here. Lapping a stock P4 heat sink won't achieve a great deal. Just replacing the stock thermal pad with a smear of thermal grease may improve performance significantly, though. I have a 17" CRT that is about 3 years old. In the last few months it has kind of been dying. It gets dark in the middle from top to bottom, and gives off streaks from light colored parts of the desktop. If I give it a good whack, it will go back to normal. I was wondering what's going on. Also, I don't know if it makes a difference, but recently moved to high altitude, (7500 feet in Colorado ski country) and the problems started shortly thereafter. If hitting it makes it come good, then its problem is very probably one or more dry, fractured or otherwise defective solder joints. Opening it up and resoldering every suspect pad on its circuit board(s), a process which optimally should not include the electrocution of the repair operative, should make it reliable again. It's not likely to be because of the altitude difference, but shock and/or vibration during the move could easily have pushed a solder joint into flakiness. My old workhorse P-II 300 recently died a loud and smoky death. On closer inspection, it was obvious that the capacitors next to the CPU MOSFET had decided to turn themselves inside out. Cool trick, but not great for productivity. About 6 months prior to this happening, I carried out the "7 volt" fan mod on the PSU fan (using the difference between the +5 and +12 volt rails). I read up on the mod before I carried it out to make sure that it wasn't going to fry anything, and the general consensus was that it is harmless. It got me thinking though. Could this drag the 5 volt rail up or otherwise bugger the voltages around enough to cause the sound and smoke spectacular? The mod is unlikely to have caused any problems. You probably just had a motherboard with crappy capacitors. This is far from unknown, and was a bit of a scandal recently. Electrolytic capacitors (especially low value units) naturally dry out over time anyway, and will normally die when overworked, which they may be because of a PSU defect or motherboard regulator oddity. So it's not necessarily the caps. But the seven volt mod definitely isn't the culprit. Having a masochistic streak, I ride my pushbike to work. Trouble is, winter mornings pre-dawn in Canberra would freeze the balls off an optical mouse. My problem is my bike headlight. Is it my imagination or does my alkaline-battery powered headlight go dim in seriously subzero weather? I know that my pedalling legs can't keep the wattage up without suitable thermal cladding. Do batteries have the same problem? I'm thinking of buying a fancy headlight with a rechargeable battery when I get the credit card back below its limit. Should I be looking for one with a lead-acid battery, with a NiCd or with some other kind of rechargeable battery (the headlight, that is, not the credit card)? It's not your imagination. Alkalines, and batteries in general, don't work well when they're freezing cold. This is not particularly amazing; batteries are electrochemical devices, and chemical reactions all go slower at lower temperatures. This, to give an example, is why the LED headlamp I review here comes in two models. The one I checked out is the temperate-climes version that hangs the battery pack off the back of your head, but there's another one with the pack on the end of a longer wire, so you can stick it in an inside pocket in your mountaineering gear (or whatever) and prevent it from freezing. That's one solution to battery freezing; keep the blighters warm with your body. It's not as convenient for a cyclist as for a hiker, but it still isn't terribly difficult to rig a cable to pretty much any headlight, and put the battery in a little pack, what have you. Alternatively, you can use lithium cells. If a light takes AA batteries then you can very probably run it from lithium AA cells; they don't have a water-based electrolyte, and are therefore supposed to be good down to 40 below zero (either Fahrenheit or Celsius - minus 40 is where the two scales meet!). Various studly little ultra-bright flashlights use three volt CR123 lithium batteries; you can get those pretty cheaply if you buy in bulk, but lithiums of all kinds are expensive compared with alkalines. Lithium AAs also have a 1.7 volt per cell open circuit potential, which means they can overdrive touchy little filament lamps. If you use two AA lithiums in a two-cell Mini Mag-Lite, for instance, you'll go through at least two bulbs per set of batteries. NiMH cells, and good old NiCds, work OK at pretty low temperatures - down to about -5°C, with significant capacity and voltage drop-off below that. The commonly quoted temperature range for NiCds and NiMHs and sealed lead acid goes down to -20°C, but at that temperature NiCds and NiMHs will give you less than 20% of their rated capacity, and less than 1.1 volts per cell, probably with substantially elevated internal resistance, too. Lead acid batteries are happier with extreme cold, but I don't think they'll give you enough of an advantage in mere few-below-zero temperatures to justify their extra weight or slow charge time. They are cheap, though. Lithium ion batteries are good in the cold, and light, but their high purchase price, fiddly charge behaviour and low lifespan rules them out, if you ask me. By the way, low temperatures greatly reduce the normally lousy self-discharge rates of NiCd and NiMH cells. You can expect these kinds of batteries to lose a few per cent of their charge each day at normal room temperatures, but they'll hold something like nine-tenths of their charge for a month at zero Celsius. I know I've seen the weird looking tank in this screenshot from the new BF1942 expansion; I seem to think it was on your site. Was it? The one with the Humungo-Gun is a Sturmtiger; the AA tank is a Wirbelwind. If they implement a realistic ten-to-fifteen-minute reload time for the Sturmtiger, it'll be a very boring tank to play. I've linked to info about the Sturmtiger in passing before, since it is, beyond question, the Butchest Looking Tank of All Time. I occasionally get mail from people who want to advertise on Dan's Data. I generally tell them I'm not interested, because the site's already pretty well loaded with ads. Some of the inquiries are more amusing than others, though. I would like to know what you would charge for placing advertisements on your Web site. I am different from the average advertiser in that I am only looking for Google page rank. I do not care about how many impressions I get or even if absolutely no-one sees the link. I only care that there is a link from one of your highest Google ranking pages to mine. This link could be in the form of a one pixel image the same colour as the background hidden at the bottom right of a page. The linked site will be my wife's blog on weight loss. She's lost 16 kilograms, BTW. This site will also contain advertising for Weight Watchers. Let me know if you are interested and what you might charge. A couple of days ago I sent you an e-mail enquiry about placing an ad on your website. Just wondering if you had given it consideration. It is, I believe, an unusual request so I would be happy to answer any questions about it you might have. I can be contacted by email or you could just call me. I did reply this time, but all I said was "Sorry, but I have no interest in helping you fool Google." This was a variant on my boilerplate reply to people who read this and then ask me to help them kill a computer and make it look like an accident, so the insurance will pay out or Mummy will buy them a newer model or whatever. Advertising is used to "fool" people all the time. It fools people into believing that drinking cola is somehow fun or cool. It even fools people into believing that fast food is an essential part of a healthy diet. And, yes, small and new businesses can use it to fool people to believing that said business is more successful and larger than it really is. What is real is my wife's weight loss. Weight Watchers is a well respected company with strong scientific backing to its method. (It basically uses simplified kilojoule counting.) I don't feel any guilt encouraging people to try it, especially when you look at the other weight loss junk that's out there on the Web. Got any spam for weight loss pills lately? I'm certain that you should have no interest in how my business goes or works. I was hoping you would be interested in the money I would pay you for placing these ads. > Advertising is used to "fool" people all the time. Yes, it is. And that's a bad thing. I'm not sure how you think that's going to persuade me to help you. I run ads on my site because I need to make a living. The banners and buttons and pop-ups don't make a whole lot of money; far more of my income comes from my "you can buy this product that I just reviewed from..." links to my major sponsor, Aus PC Market. But, at least, the other ads are generally a thing that gives you some idea of what you're going to get when you click on them. You, in contrast, just want to fake out Google, and push your site - of which you haven't even told me the URL, which suggests to me that you don't think the site itself has anything on it that'd encourage me to go along with your scheme - further up the Google rankings, as if it were a valuable resource that people with popular Web sites linked to because they thought it was good, or interesting, or something. Even if I thought it was a good idea to urinate in the Google page ranking pool, it wouldn't be in my interest to do so. The people at Google are clever, and very aware of attempts to do things like this. It's quite easy to scan a database like Google's for single-pixel-image links and similar "invisible" connections, and to work up an automatic "suspiciousness index" for URLs that have lots of such links pointing to them, and to push the rank of those URLs, and of the sites that host the links, down proportionally. I don't want that to happen to me. > backing to its method. Yes, it is. That doesn't give you the right to an unrealistically high page rank. If someone searches for "lose weight" on Google, www.weightwatchers.com is hit number six, at the moment. Hurrah; people who want to find it, can. That's where someone who's interested in losing weight should go, right? If you want to encourage people to try Weight Watchers, then you should link to weightwatchers.com yourself, and then make your site popular by honest means. > business goes or works. Of course I should have interest! For all I know, you're selling Powersauce bars made from apple cores and Chinese newspapers with fake Weight Watchers logos on them! Maybe you're just selling recipes, or something. But there's no way for me to know, since you haven't told me where your site is.